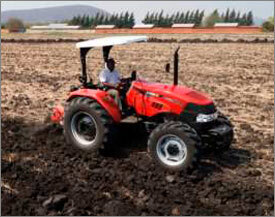 The Farmall JXM series is powered by the Iveco S8000 series engines which are available in two versions, 80 hp and 88 hp. The four-cylinder turbocharged powering is further enhanced by the intercooler in both the models. The lower cooling requirements ensure high fuel efficiency and considerable savings. The no-rust 90 litre fuel tank does not require refuelling even when the tractor is used for long hours. The engine produces torque of up to 340 Nm and 30 per cent of torque backup. Tractors in the Farmall JXM series come standard with 8x8 and 12x12 transmissions, as well as an optional 20x20 creeper variant which offers speeds as low as 280 meters per hour which is ideal for specific applications such as trenching, vegetable farming and mulching. The double clutches design optimises the transmission system in order to deliver best-in-class fuel and power efficiency, as well as continuous implement operations. A dash-mounted shuttle lever provides fast direction changes and effortless manoeuvring. The tractors' three-point hitch has a lift capacity of 2,000 kg while the optional assisted ram feature provides extra lifting power up to 2,500 kg for heavier implements. An additional height limiter ensures accurate setting of the implement lift height which is very helpful in applications such as spraying, grass mowers or spreading. A safety valve keeps the implement in a locked position during transport. The unique sensitivity valve adjusts the speed of the draft sensing according to the soil and the implement.